When I got to the pile some of the California OES officials had arrived on the site and I ran into Bill Lokey. 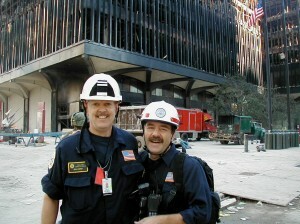 Bill Lokey was one of the original TFL’s with me when the FEMA US&R program started and came from WATF-1. 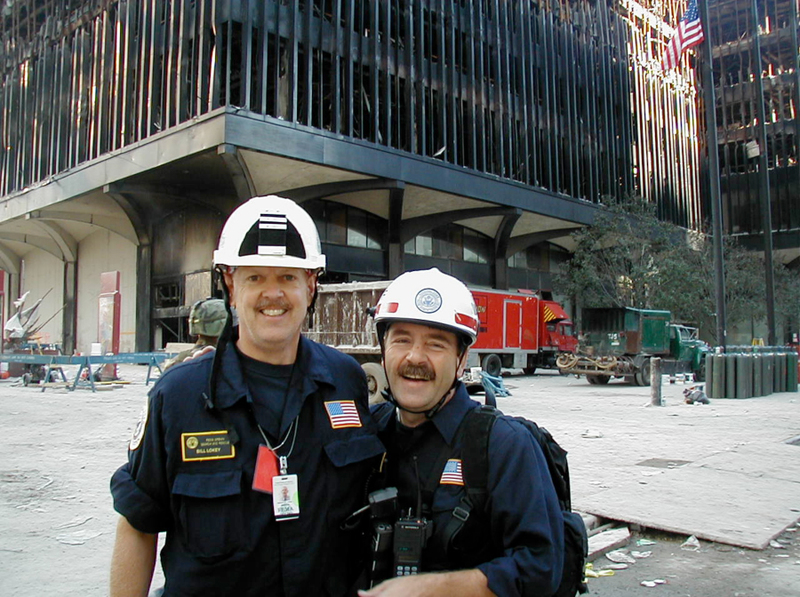 Bill became the US&R Working Group Chair and also rose to become a Federal Coordinating Officer (FCO) for FEMA. Bill was the FCO for the FEMA response to Katrina and took a lot of undeserved hits for his role in the response. Word came down that it would be our last day on the pile and we were going home. We spent most of the day packing and cleaning. I gave someone at FEMA permission to keep our tents (I knew they would let us purchase replacements). After all the trucks were loaded we all lined up and marched out, two by two out of Ground Zero for the last time. 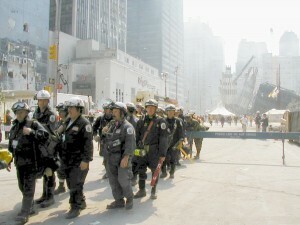 MATF leaves Ground Zero for the last time. Of course now there were much discussion about why we were leaving when there was so much left to be done. Quickly the mind set of staying changed into the mind set of “let’s get home”. Some official from FEMA Washington told me that I had to take our Task Force to some Air Force base in NJ before we left in order to be “stress debriefed”. A series of very heated telephone calls took place over the futility of taking 72 very tired individuals one hour south to listen to someone tell us “I know how you are feeling” and then head north for a trip that is now 5 instead of 4 hours. In the end we worked out that we could do our stress debriefing at home. Of course the “frosting on the Cake” was the FEMA IST asked if, after sleeping on the Javits center main room, I could move all 72 TF members, 4 dogs, all of our sleeping gear to another smaller room on the second floor to make room for a California TF that would be taking our place. To my surprise most of the TF members were too tired to complain and dragged everything up to the 2nd floor for one night.